The Anthropocene is the concept that humans have had such an impact upon the functioning of the Earth system that a new geological time interval should be designated to signify this. 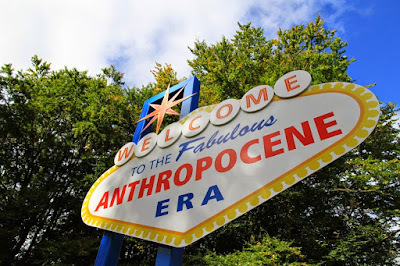 This will probably mean that the current epoch, called the Holocene, which started 11,700 years ago when the Earth warmed up naturally at the end of the last glacial, will be designated as having ended and the Anthropocene as beginning. However, scientists are currently arguing over when exactly the Anthropocene began – was it thousands of years ago when ancient farmers started chopping down trees, at the time of the Industrial Revolution when coal started to be burnt in vast quantities, or after the Second World War when there was the rapid industrialisation of much of the world? We decided that we would use our expertise in stable isotope geochemistry to review the evidence that isotopes provide for human impacts on the Earth system. Isotopes are different types of an element – they have the same number of protons but a different number of neutrons. The ratio of one isotope of an element to another can change due to human impacts. Therefore, we can use these isotope ratio changes to investigate when the human impact on the Earth really reached the extent to which we might want to define the Anthropocene as having begun. 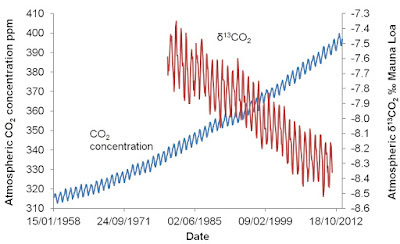 The carbon isotope ratio shows a big shift, recording the release of carbon dioxide into the atmosphere because of the burning of fossil fuels. 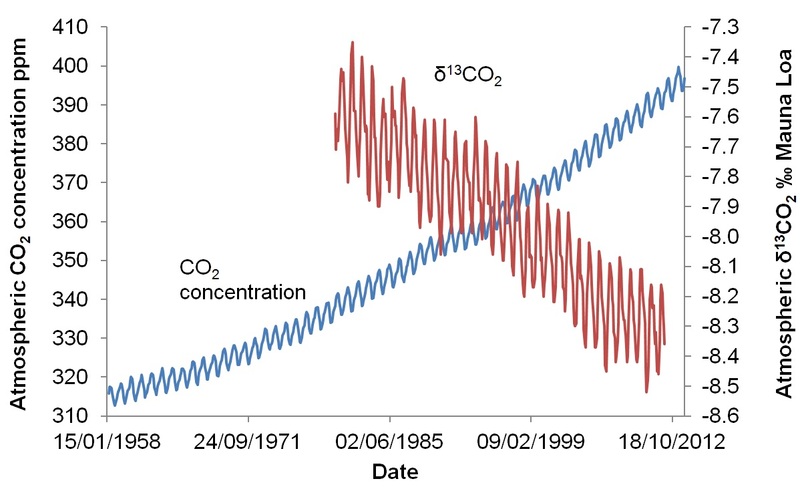 Boron isotopes show there has been ocean acidification, related to this release of carbon dioxide. The nitrogen isotope ratio also shows a shift, recording in particular the increased production of artificial fertilisers. Lead and sulphur isotopes record air pollution related to human activities. While some of these isotopes show changes millennia ago, indicating a long history of human impacts on the environment, overall it was around 1950 that isotopes really suggest there was a big change in the functioning of the Earth system, when humans became the dominant force of global environmental change. This is around the time of the so called ‘Great Acceleration’, when human population growth and industrialisation really took off, leading to the sorts of impacts that the isotopes record. If we did set the Anthropocene boundary at around 1950, we need what is called a ‘golden spike’ – something that will be locked away in the rock record and that in a million years time a geologist could find and use as a marker for when the Anthropocene began. Isotopes can also help with this as isotopes of plutonium were released around 1950 because of atmospheric nuclear bomb testing. These isotopes did not really exist on Earth before this, and because their occurrence coincides with this ‘Great Acceleration’ in human impacts on the Earth, this can be used as the golden spike.